When I learned to cook, from thick-headed Frenchmen in culinary school, the focus was on all manner of exotic ingredients. In fact, there was a class where they just laid out a bunch of different ingredients on a table and you had to write down what everything was. I did poorly. Mostly because the only bean I could remember was a calypso bean because it kind of looks like a killer whale and Jacques Cousteau's ship was called The Calypso. All other beans looked the same to me. Nowadays local is the theme. I would imagine that most of those thick-headed Frenchman would be recoiling at this new trend if I thought any of them were still alive. They were chain-smoking elderly men with not a shred of humor and I imagine that if the smoking hasn't killed them by now the stress from being so uptight surely must have. For tonight's dinner I wanted to return to those days of unnecessary excess and see if I could use as many ingredients from as many different countries and continents as possible. For the first course I made this new world salad. 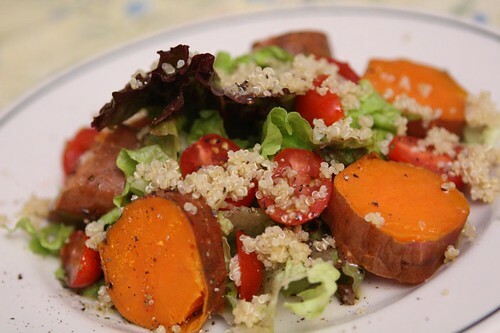 This features roasted New Jersey sweet potatoes (North America) with quinoa from Peru (South America) and some sliced grape tomatoes. I imagine this is what explorers brought back to Europe to serve to their kings and queens. They too would have used exotic tropical lemon juice and olive oil from Italy. Then their kings and queens told them not to bring back any of this "hippie food" any more and had them executed. For the second course I cooked up some shrimp from Thailand (Asia). I tossed in some coconut milk from Thailand along with some roasted red chili paste, and tamari and cooked it down. 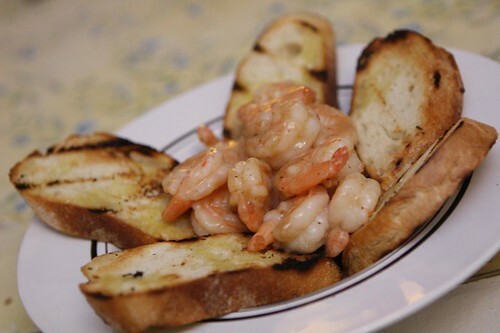 I served the curried shrimp with some grilled slices of baguette. This dish was reminiscent of something we had on one of our first dates in Providence, RI back in 2002. The restaurant, Neath's, is now closed but the coconut crostini came back to life (sort of) with this attempted recreation. 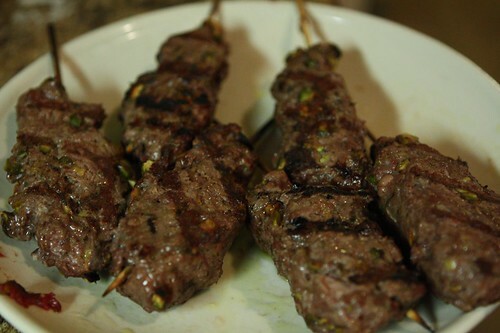 For the main course I made these venison kebabs with ground venison from New Zealand (Oceana), with chili powder, cumin, lemon zest, thyme, and crushed pistachios. 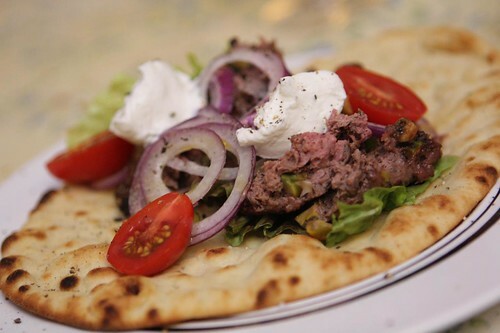 After grilling them I served them on some grilled naan with salad greens, sliced red onion, and a little yogurt from Greece (Europe). On the naan I smeared a little harissa from Tunisia (Africa) to make sure all old world continents were covered. And what drink would I pair with this? 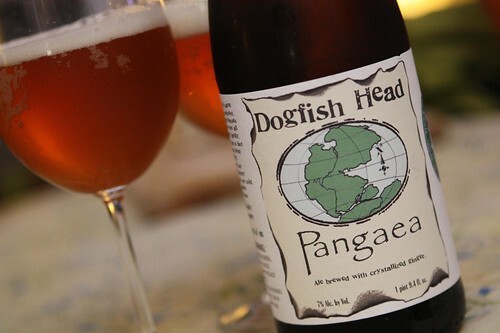 Well, Pangaea, of course, from Dogfish Head. Pangaea is beer made with ingredients from all seven continents including crystallized ginger from Australia, water from Antarctica, basmati rice from Asia, muscavado sugar from Africa, South American quinoa, European yeast, and North American maize. Here's my favorite bro-master talking about this beer. When I'm bummed I also like to watch movies about dinosaurs so I know how he feels. For dessert we had a return to basics. 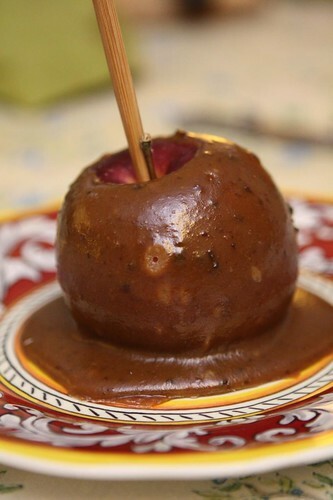 Jen made these caramel apples with apples from our fruit share. It all returned back home to New York. This was a noble experiment. My only regret is that I could not get any reverse-osmosis glacier water from Antarctica to boil some pasta in or something. At any rate, it's nice to know that my meal featured ingredients from every continent in some small degree. The French chefs who instructed me would be proud. While this dinner didn't feature any traditional French recipes or unnecessarily precise vegetable cuts it did, at least, exhibit excess in its sourcing of ingredients. 1st- looks great! 2nd- where is the citation for the hippie quote? Doug demands credit where credit is due. I challenge you to provide evidence of this "quote" about European monarchs demanding to have hippies executed when bringing quinoa back to Europe after exploring the new world. Give me some linkage and I will gladly apply add a footnote to the entry.